The Lionhead Goldfish is one of the most frequently kept goldfish variants. The Lionhead Goldfish is one of the older types of goldfish and its closest ancestor is the Egg-shaped Goldfish. In China, the Lionhead Goldfish was named Shou-xing after the Chinese God of Longevity – Shou-xing Gong. The Lionhead Goldfish can be recognized by its well developed headgrowth (wen). 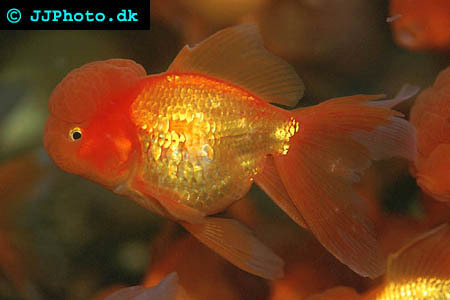 The Lionhead Goldfish is however sometimes mixed up with the Ranchu Goldfish. The body of a Lionhead Goldfish is egg shaped and rather streamlined, and there is no dorsal fin. There should be quite a lot of fat around the belly and the body depth is ideally larger than ½ to 5/8 of the body length. The Lionhead Goldfish has a double caudal fin, and the individual lobes have no webbing. If the headgrowth grow too large it can become a nuisance for the fish, since it can cover the gills and make it hard for the Lionhead Goldfish to breathe. You can find several varieties of the Lionhead Goldfish. When it comes to colouration, you can choose between red, orange, chocolate, blue and black if you want a metallic coloured Lionhead Goldfish. The nacreous types are bi-coloured with red/white or red/black combinations, or tri-coloured in red/white/black or calico. There are also a few examples of red cap Lionhead Goldfish, a fish that features a bright red headgrowth while the rest of the body is pure white. A completely white Lionhead Goldfish is very hard to find, since white is the traditional colour of death and mourning in China. All the white goldfishes have therefore been culled out and never allowed to take part in breeding process. The Lionhead Goldfish do not only come in different colour variations; they can have somewhat different bodies as well. One of the more rare types is the long-finned Lionhead Goldfish, a very graceful fish that unfortunately can very be hard to obtain. The size of the headgrowth also varies between different Lionhead Goldfish, and some fish are almost completely without a headgrowth while others are troubled with headgrowths so large they are covering the eyes or gills of the fish. The Lionhead Goldfish is one of the larger goldfish types and requires plenty of space. It often grows larger than 10 inches. A small Lionhead Goldfish can do well in just 10 gallons of water, but more is always better. 15-20 gallons of water is considered a minimum for an adult Lionhead Goldfish. If you provide your Lionhead Goldfish with enough space and good care, it will reach its full potential and grow into a very impressive goldfish. All goldfish variants produces a lot of waste products, and keeping a goldfish in a small bowl or small aquarium will usually result in poor water quality quite rapidly. Your Lionhead Goldfish will thrive in a pond, but you might have to keep him indoors during the coldest winter months if you live in a very cold area. The Lionhead Goldfish is not very aggressive and will get along fine with most other types of goldfish. You should however avoid fast goldfish types, since they might eat all the food and leave your Lionhead Goldfish starving. Koi, Comet Goldfish and Shubunkin Goldfish are therefore not recommended companions for a Lionhead Goldfish. Choose more slow moving goldfish types instead. If the headgrowth begins to cover the eyes of your Lionhead Goldfish, you need to make sure that he finds his food. A vision impaired Lionhead Goldfish is best kept with other visually handicapped goldfish types, such as Bubble Eye Goldfish. You can feed your Lionhead Goldfish flake food, pellets, vegetables etc. If his eyesight is poor, you should avoid food that moves around in the aquarium. Feed him from your hand, or use a food clip or food cone. Sinking pellets placed at the same spot every time is also a good idea.